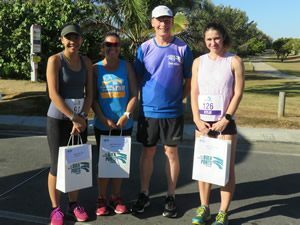 Mackay Road Runners annual North Qld Bulk Ports (NQBP) Open and Podiatry Mackay Junior Magic Mile was run and won in perfectly picturesque conditions from the start of beautiful Mackay Marina Breakwater. The Club’s Signature Club Championship event was sponsored by long term supportive sponsors – North Queensland Bulk Ports and Donald Orr’s Podiatry Mackay. Elite champion runner, Julian Picot broke the tape first after over thirty runners sprinted from the gun start towards the halfway turnaround point, approximately 804 metres onto the Breakwater from the entry point. Julian took out maximum overall Club Championship and age category points ahead of Nick Rewald, junior sprinter Will Morgan and Carl Pinkstone. First female, Kylie Harbour showed her awesome sprinting style over the tough distance which can be more challenging than the longer distances. Karla Hook claim second with Dannelle Thompson taking out the final podium place. Many thanks to NQBP’s Acting CEO Brendan Webb and Amanda Blines for presenting the prizes from NQBP and local Mackay Marina Businesses for the Open race. Under eighteen male winner, Will Morgan, ran superbly to claim the title in his age division and third overall in the open division. Simba Walz also had a great outing scoring silver in the under eighteen male section. First female in the under thirteen years, Millie Bishop was ecstatic with her placing and prize from Junior race sponsor, Podiatry Mackay’s Donald Orr. Sam Riggs was also elated with his race, staking a gold claim over the under thirteen boys and more experienced senior runners. All junior runners are now heading away this week towards representative duties in their pet events. Excellent running came from North Queensland Bulk Ports Acting CEO, Brendan Webb who sprinted alongside Mackay Marina resident, Leon Else. Wayne McMurtrie, Stuart Sprott, Mitchell Thompson, Gaven Porter, Rodney Yates, Allan Zamparutti, Ross Connor, Ricky Parker, Geoff Neale, Scott McIntosh, Simon Henderson, Jan Smith, Cilla Martland, Kim Saron and Leanne Connor were also in fine form over the sixteen hundred and nine metre event. The coveted Magic Mile Milo Award was this year taken out by birthday girl, Kim Saron. Kim was stoked to be presented with the large tin of Milo, which will no doubt be a welcome boost to her training and racing regime. 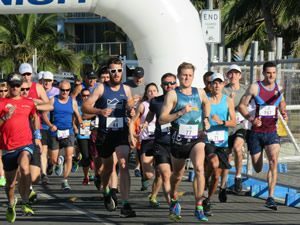 Congratulations to all local runners who were competing in the many other events on offer on the same day as the Magic Mile including the Run The Whitsunday Great Walk at Airlie Beach. Many thanks to North Queensland Bulk Ports, Podiatry Mackay, Mackay Road Runners President Tim Magoffin, Race Day Director, Andrew Short, Time Keepers Peter Wright and Mark Walz and photographer, Jo Hughes. This Sunday’s Club event promises a few challenging sections as runners look forward to the Activ8 Bonson’s Scrub 6km & 12km undulating race. Activ8’s Nikki Giles has supported this event over the last few years with a prize for the best improved time by an individual at this event, in either the 6 or 12km event. Many thanks to Nikki and her Activ8 Team. Runners are requested to meet at the Coningsby Primary School carpark by 3.30 to carpool as the race start does not cater for a lot of vehicle space.